These products provide a measurement environment for cases where noise levels generated by the target equipment are low, or where the influence of ambient background noise on the measurement is to be avoided. 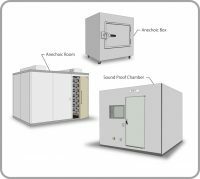 A sound proof chamber or box provides a measurement environment with low background noise for cases where noise levels generated by the target equipment are low or where the influence of ambient background noise on the measurement is to be avoided. The product range also includes anechoic chambers or boxes where the influence of reflections within the chamber/box is minimized.